Gloat, gloat | carpe diem! Sorry. Well, I am. It’s rude to gloat. Colour me chastened as I remind myself that there are undoubtedly many other people who would desperately like this yarn, just as my father reminded me of the starving children in India who (he said) would give almost anything for the brussels sprouts (scroll down to the bit about ‘hated vegetable’) I flatly refused to eat. I was a precocious brat: I offered to post them to India myself. I’m not going to offer to post this lot to anyone, though. Not unless you’re holding my cats hostage. 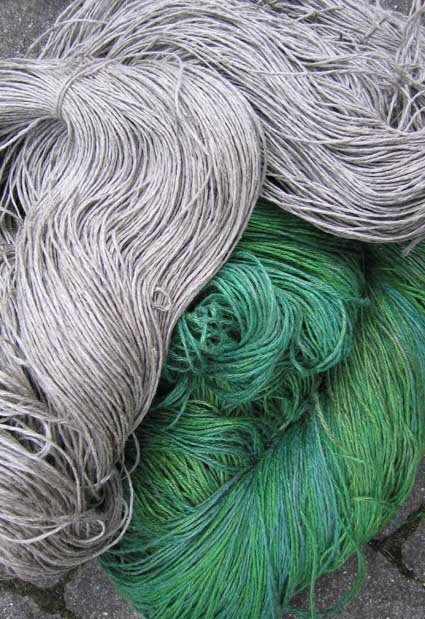 You know what skeins of sock yarn look like, so here’s the detail. 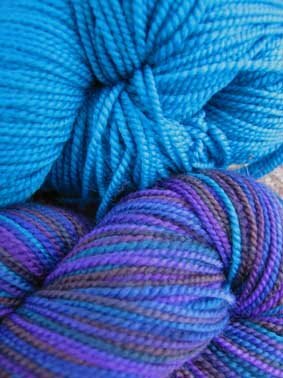 One skein Cherry Tree Hill in a true, deep, bright turquoise and a second in a colourway that includes that shade, for two pairs of simple intarsia socks. Eventually I want to make these. It may take years of practice! Habu. I could cheerfully have carried off most of that stall for weaving as well as knitting (I’m not that enthralled by the metal blends). Three x 337yds of Kusa x2 for two shawls. One, probably the green but the cream is soooo beautiful will be a Wing o’ the Moth for me, I don’t know what I’ll do with the other, or to whom I will gift the result. Some hand-dyed variegated Kusa because after picking it up I couldn’t, just couldn’t put it down. I have begun to realise that a really good yarn store is going to be as dangerous as a really good bookstore. Or worse. The cashmere stuck to me too; it was about that point I started dropping stuff and the kind lady in charge gave me a basket. Nefarious plan, that, foiled by the arrival of HPNY Knits. The curicura silk (the golden stuff at bottom left) was purchased on my farewell visit to the stall. That’s the natural colour of the silk; the cocoons look as though they’ve been hammered and shaped from sheet gold, and the yarn seems to be made of miniscule filaments of pure gold that glisten as the light strikes them. Google in English can tell me nothing about what or who that silk comes from, but it’s going to make a beautiful little scarf for me, and perhaps another for a gift. It’s worth noting that the $ -> £ translation was fair, so this haul was remarkably reasonable in price. That’s the knitting stash fed. What about the weaving stash? We recently refurbished the bathroom/loo (depending on continent): after 10 years, it needed it. The old roman blind, a fetching faded nautical blue stripe, is completely inappropriate in the new sage green and tan environment, and I’ve been thinking about weaving the fabric for a new one as a minor challenge. The hemp was perfect, or at least so close to perfect I couldn’t ignore it. This will be a silver-grey ground with green lines running across it, possibly even vaguely tartan-ish blocks. I have to think about it a bit, because by itself the green in reality is dangerously bright. It looks like sunlight through grass, and I hope I have enough left to make something totally, vividly green for M, who would love this. Spinning? Do I deserve anything? Is it happening? 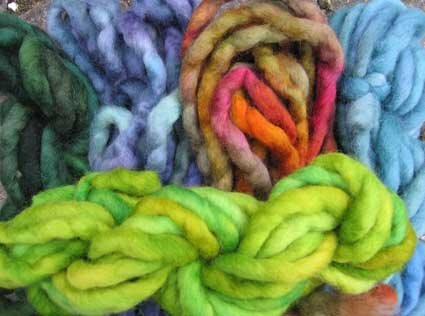 I bought some fibre because I have no idea when I’ll see anything like this again in person, and colours are difficult to choose online. Roving from 21st Century Yarns, feels a bit stiff/felted to my inexperienced touch, but the owner promised it would be spinnable and it did spread out into fibres when I tugged at it a bit. I wonder if that’s because it’s merino and I’ve only handled blue-face leicester? Also some weird hand-painted silk tops from Oliver Twist. 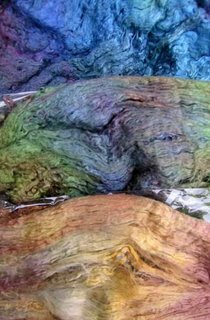 In Real Life these look like as though someone has solidified the rainbow of colours on a thin film of gasoline, or the shades of blue on the side of a soap bubble. 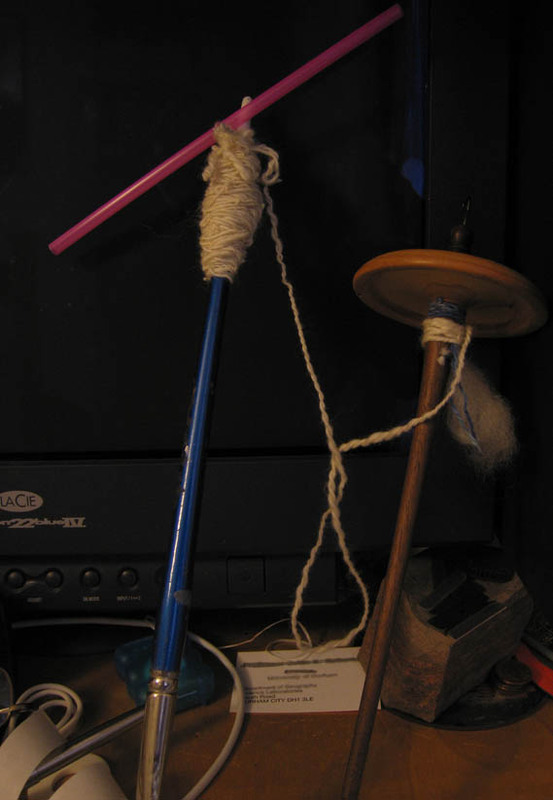 I don’t know how to spin fibre as long as this (the filaments are at least 12″ long), but I can research and invent. And I will, because it is happening. I’ll spare you my first-ever singles, but here is my very first 2-ply, from my second-ever singles, photographed within seconds of its manifestation (note the surroundings. I was spinning instead of working. tsk, tsk)I think it’s a good sign that the plied yarn hangs nicely in a loop. I know the tangle at the top of the nostepinne-equivalent is a bad sign, but hey, it’s a learning experience (the straw is part of the solution) and I’m too thrilled to mind untangling this precious length of yarn. It’s my yarn, I made it! And, if the Fates are kind, tomorrow I block KiriBlue. I have more sympathy for the Fates now. I hope Clotho has a nostepinne. This entry was posted in Uncategorized on October 16, 2006 by sarahw. Very well-chosen yarn, Sarah. All of it is gorgeous. I’m wondering where you live and whether your cats spend much time out and about….I’m interested in the weaving thing. I don’t understand it exactly. Do you literally weave a fabric? Not like spinning, where you produce the yarn and then make something from it. I know that (I think). Mmmm. Interesting. Love that green. What an incredible haul…I’m envious! And, don’t worry, you can spin anything. Predraft that felted stuff (pull it apart) before spinning and you’ll be fine. 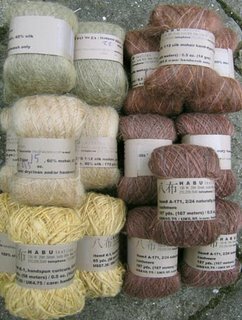 Same with silk.Is the habu you bought silk/mohair? That’s what tempted me. I only have one skein, but I’m sure it will make magic someday! you did good girl!! very very respectable sash enhancement.🙂it was fun hanging out with ya’. we’ll have to do it again!let me know if I can send you some Mountain Colors ‘Bearfoot’ sock yarn. anytime! ooh, HPNY, don’t tempt me. At least not until I’ve paid the credit card bills for that lot!The weaving makes fabric, at least if I do it right. Real cloth, suitable for clothing or blankets. Or blinds. A lot of people seem to spend a lot of time weaving scarves, but I already have knitted ones and plans for more, especially one that looks like a thunderstorm. I can weave widths up to 24″, or 48″ if I master the trick of double-weave-with-fold, so I want to make cloth. After I spin, or between spinning and knitting (yes, that is the silk/mohair mix). Where is room for work? I am envying your trip and the stash enhancement. That photo of the table of Lorna’s just left me speechless…I would love to get my hands on some of that. I’m looking forward to seeing your woven curtain and also the spinning. I don’t know about either of these, but I’m interested in learning!